Comsats Institute of Information Technology (CIIT) announced admission dates for Bachelor, Master and MS (spring 2017). Last date for submission of application form for WAH, Attock, Sahiwal and Vehari campus is 21st November 2016. NTS (NAT) base test will be accepted for admission in CIIT. Special test for Comsats will be help on 27th November 2016. Pakprep.com provides the complete coursework for NTS (NAT) Entry Test. Register here today for FREE to start your Preparation. 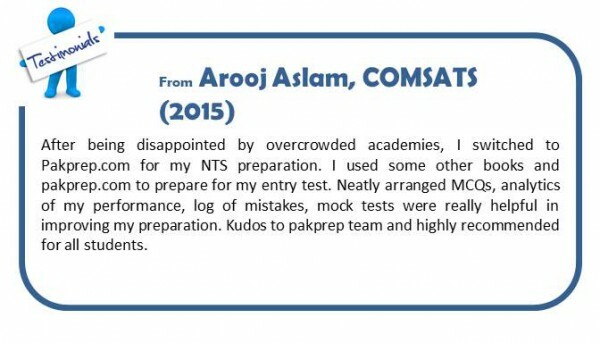 This entry was posted in Comsats, NTS, NTS NAT and tagged Best way to prepare for NTS, COMSAT Scholarships, comsats, comsats admission 2016, comsats admission 2017, comsats admissions, comstas, Comstats, Electrical Engineering admission requirements, How to Download NTS form, NAT English MCQs, NAT IE Past Papers, NAT IE Preparation, NAT IM Past Papers, NAT Pakistan, NAT Past Papers, NAT Solved MCQs, NAT Subject MCQs, NAT test, NAT test pattern, NTS, NTS Biology, NTS Biology MCQ's, NTS Chemistry, NTS Chemistry MCQ's, NTS Engineering TEST, NTS English, NTS English MCQ's, nts fee, NTS IE, NTS MCQs solved, NTs Medical Test, NTS NAT Preparation, NTS old papers, NTS Pakistan, NTS Past Papers, NTS Physics, NTS Physics MCQ's, NTS Preparation Online, NTS Solved paper, nts solved papers, NTS test, online preparation for NTS test on November 16, 2016 by Pakprep.com Admin. Federal Medical and Dental College (FMDC) is the first public sector Medical college established in (Islamabad) the capital city of Pakistan, Associated with SZABMU-PIMS. National Testing Service (NTS) conduct Test for Federal Medical and Dental College (FMDC). There are 100 seats available in FMDC for MBBS. FMDC admissions are expected to be open in September. Pakprep.com provides the mock test for FMDC that pretends the exact test for FMDC. Solving actual test format is key for you success. Join www.pakprep.com now to prepare your-self for FMDC admission test . This entry was posted in FMDC and tagged best way to prepare for entry tests, Best way to prepare for Entry Tests in Pakistan, fmdc, FMDC Biology MCQs, FMDC Chemistry MCQs, FMDC English MCQs, fmdc entry test, fmdc mcqs, FMDC Online Entry Test Preparation, FMDC Past Papers, FMDC Physics MCQs, mbbs, MBBS admission, MBBS Admission Test, MBBS in Pakistan, mbbs merit list, medical, NAT English MCQs, NAT IM Past Papers, NAT IM Preparation, NAT Pakistan, NAT Past Papers, NAT Solved MCQs, NAT Subject MCQs, NAT test, NAT test pattern, NTS, NTS Biology, NTS Biology MCQ's, NTS Chemistry, NTS Chemistry MCQ's, NTS English, NTS English MCQ's, NTS IM, NTS MCQs solved, NTS Medical, NTs Medical Test, NTS NAT Preparation, NTS old papers, NTS Past Papers, NTS Physics, NTS Physics MCQ's, NTS Preparation Online, NTS SOLVED MCQS, nts solved papers, NTS test, online preparation for NTS test on August 8, 2016 by Pakprep.com Admin. This entry was posted in Army Medical, NTS, NTS NAT, NUMS and tagged AMC, AMC Admission Test, AMC Admission test 2016, AMC Biology MCQs, AMC Chemistry MCQs, AMC Entry Test, AMC MBBS, AMC Past Papers, AMC Physics MCQs, Best way to prepare for NTS, Electrical Engineering admission requirements, How to Download NTS form, How to prepare for AMC admission test, How to prepare for NUMS admission test, mbbs, MBBS admission, MBBS Admission Test, MBBS in Pakistan, mbbs merit list, NAT English MCQs, NAT IM Past Papers, NAT IM Preparation, NAT Pakistan, NAT Past Papers, NAT Solved MCQs, NAT Subject MCQs, NAT test, NAT test pattern, NTS, NTS Biology, NTS Biology MCQ's, NTS Chemistry, NTS Chemistry MCQ's, NTS English, NTS English MCQ's, nts fee, NTS IM, NTS MCQs solved, NTS Medical, NTs Medical Test, NTS NAT Preparation, NTS NUMS, NTS NUMS Admission, NTS old papers, NTS ols paper, NTS Pakistan, NTS Past Papers, NTS Physics, NTS Physics MCQ's, NTS Preparation Online, NTS SOLVED MCQS, NTS Solved paper, nts solved papers, NTS test, NUMS, NUMS Admission, NUMS Admission test, NUMS admission test 2016, NUMS Biology MCQs, NUMS Chemistry MCQs, NUMS Entry Test, NUMS MCQS, NUMS Pastpapers, NUMS Physics MCQs, NUMS solved papers, NUMS test format, online preparation for NTS test on June 29, 2016 by Pakprep.com Admin.